Every single time Google has chosen Intel’s chips for political reasons, rather than technical ones, it has failed. According to a recent rumor, this year’s Nexus 8 (moving up from 7″, it seems) will be powered not by an ARM chip, as usual, but by an Intel Atom one. 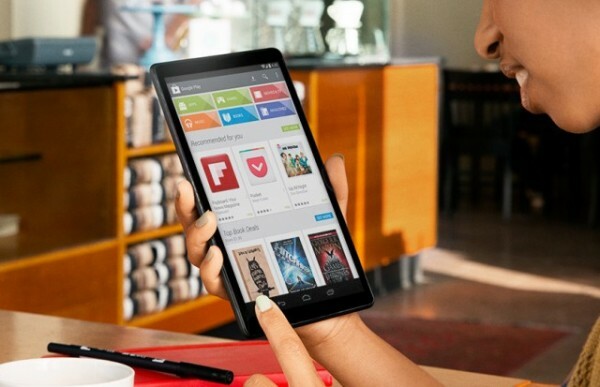 An Atom-powered Nexus 8 would be Google’s biggest mistake yet. What do I mean by “political” reasons? I mean Google chooses Intel’s chips for reasons other than technical ones or based on merit. Paul Otellini, Intel’s CEO until recently, has been on Google’s board of directors for many years, and I believe he may have had hand in pushing Google to use Intel’s chips, when ARM alternatives would’ve been a much better match. Let’s take the original Chromebooks, that came with a single core Intel Atom, the same one that we were seeing in netbooks back then. The original Chromebooks cost ~$400, and everyone back then was saying they are not worth it and that they are too expensive for what they’re offering. If it would’ve used at least a dual-core Cortex A9 instead, it should’ve had close to the same performance, but it could’ve been sold for $250 instead, and then the entire selling proposition would’ve changed, making them much more appealing. In fact, when the first ARM-powered Chromebook launched, the biggest buzz around it back then was about its “sweet-spot $250 pricing”. 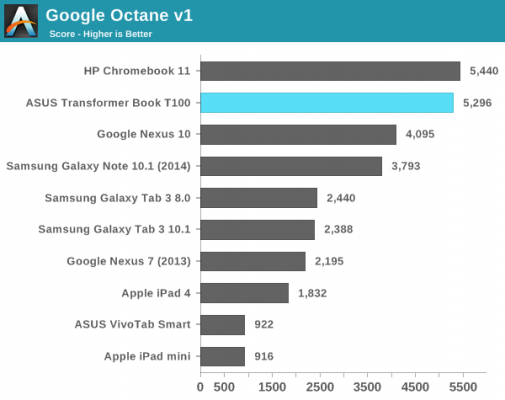 That Chromebook was also the #1 selling computer on Amazon for a whole year since it launched. If Google would’ve done this from from day one of launching a Chromebook for sale, Chromebooks might’ve taken off a lot earlier. But they didn’t do that. Instead, they chose the much more expensive Intel Atom at the time, because they were a little too friendly with Intel for their own good. They chose Atom over ARM for political reasons and they paid for it. Not too long after the first time they made the mistake of choosing Intel over ARM for Chromebooks, Google repeated the mistake by putting Atom once again in the first Google TV. That made the set-top box cost $300, which everyone (except for Google apparently, who were too busy accepting the bad deals from Intel) thought was an insane price tag from day one. They’ve also had many compatibility issues with that device back then, because it wasn’t based on ARM, and they had to rewrite a good portion of Android back then to make it work for Atom, which later also took them a long time to convert to ARM-optimized code, and release Google TV for some ARM-powered set top boxes that started out at $99. Yes, Chromebook 11 is from 2013, but it uses a 2012 chip – the exact same Exynos 5250 with a dual core 1.7 Ghz Cortex A15 and Mali T604 GPU that Samsung’s own ARM Chromebook was using. Don’t ask me why HP would launch a new Chromebook, that costs $30 more, with a chip that was in the previous gen Chromebook, but the important thing to remember is that it’s not a new chip. Then we have the Bay Trail chip, that was launched on 22nm Trigate/FinFET, a year after the 28nm non-FinFET Cortex A15, that appears in the Transformer T100. As you can see, even though Intel is a full node (FinFET/Trigate improvement is basically the equivalent of a full node jump) and a half (22nm vs 28nm), it still falls short of Cortex A15, a CPU that came out a year before it. Some tests may put it slightly ahead of Cortex A15, especially in Android (rather than ChromeOS), and you can even see that above with the Nexus 10, but considering it’s a node and a half ahead of Cortex A15, and costs almost twice as much, it’s not exactly in a position to brag about. As you can see, normalized for the same 1080p resolution, Bay Trail’s GPU scores roughly the same as the Adreno 320 GPU (also from 2012; first seen in Nexus 4). Adreno 330, Tegra 4 and Apple’s A7 GPU’s were already twice as fast as Adreno 320/Bay Trail GPU. This year we’re going to see Adreno 420, Tegra K1, Mali T760 and Apple’s A8 GPU that all are going to be again at least twice as fast as Adreno 330 and the rest. 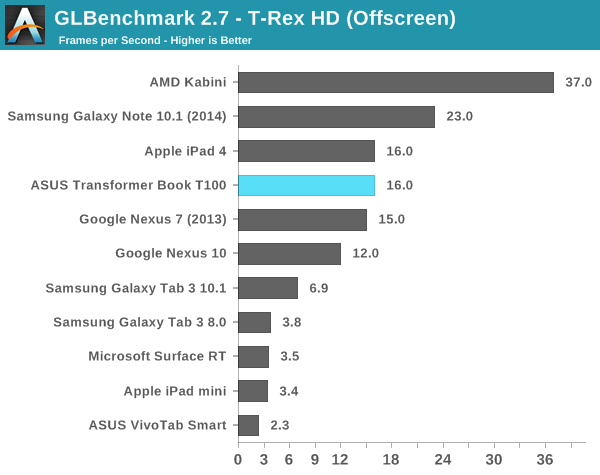 So that’s at least a 4x difference in GPU performance compared to last year’s Nexus 7. Yet knowing all of this, Google wants us to accept a GPU and a CPU that barely matches the performance of ARM chips from 2012, and for that we get the privilege of paying almost twice as much for it (maybe not by adding to the retail price, but through not upgrading other components, or making the device $199 again)? Why? Intel has proven year after year that they can’t really be competitive with ARM chips, even as they have a 3 year process advantage ahead of ARM chips (the node and a half I was talking about earlier), and they keep pushing out chips that are at least a generation behind ARM chips, performance wise, especially when it comes to the GPU. But after all of this, Google decides to push Intel’s chips on us, not because they deserve it, but because for some reason it’s a good political move for them. Well, they should be ashamed of that. We, as customers, want devices that are the best for technical reasons, not because Paul Otellini plays golf with Larry Page. This may be part of a larger trend in Sillicon Valley as it moves away from the meritocracy culture it once had, to a more relations-based culture, but I don’t have to like it or agree to it. I expect Google to always care about its customers first, and not try to cheat them so they can get a better deal somewhere else.